Today's recipe has been adapted from a recipe I found on a Facebook recipe group for mom's in my area. Many times a week, Tracy posts wonderful photos of meals she prepares for her family. As soon as she posted her recipe for Crock Pot Chicken & Peppers, I knew right away I had to give it a try. Tracy's recipe is super-easy ~ using 6 boneless chicken breast, chopped green peppers, canned sauce and diced tomatoes (packed with basil, garlic and oregano). I made changes based on the chicken available in my fridge and the veggies in my bin that needed to be used. I also added some Italian Seasoning and crushed red pepper flakes to add a little zing! Place chicken in crock pot, and cover with remaining ingredients (except pasta). Cover and cook on low for 6 to 8 hours*. Remove chicken and place in a bowl, allowing to cool slightly. When cool enough to handle, remove bones from chicken. Add meat back to sauce, stir to combine. Allow the chicken and peppers to cook on low while preparing pasta according to package directions on the stove. 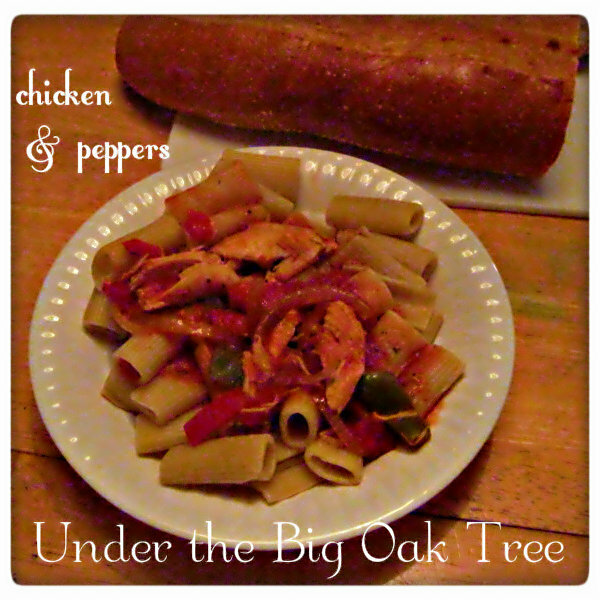 Pour cooked and drained pasta into a serving bowl and top with the Chicken and Peppers Sauce. The original recipe called for Contandina Sauce and DelMonte diced tomatoes. Since I used bone-in chicken, I wanted to remove the chicken before it started to fall off the bones so there weren't any stray bones in the sauce. At about the 6 1/2 hour mark, I removed the chicken from the sauce and placed it in a large bowl and allowed to cool for a bit. Then followed the remaining steps of the recipe. I loved this meal and plan to keep it in mind next time chicken is on sale! So easy and so flavorful! I may have to make this the next time we have company for dinner! 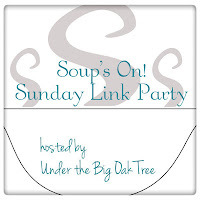 Don't forget to come back on Sunday and bring your best soup recipes for Week 2 of Soup's On! 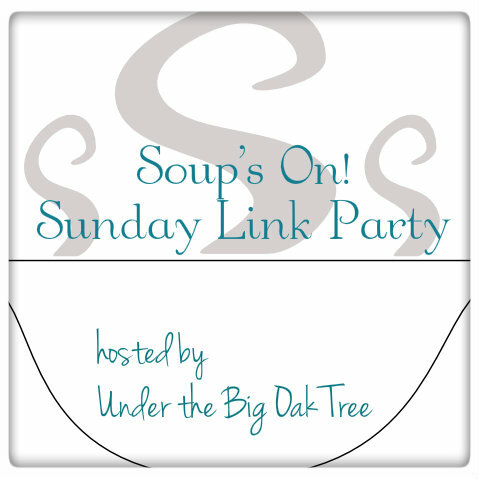 Last week's party was a huge success with a very delicious grouping of soup recipes! Please stop by and show your support for week 2! The party will go live at 12:01am on Sunday! Your Crock Pot Chicken Peppers looks so good, we would love this recipe. Hope you are having a great weekend and thank you so much for sharing with Full Plate Thursday.